None of the articles on this website are written for the express purpose of selling a product. The Gemsbok is independently owned and the opinions expressed here are my own (or those of featured guest writers, where indicated). 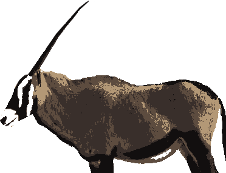 Most of the links on my website are to non-commercial supplemental materials, such as relevant videos, encyclopedia entries, other Gemsbok articles, or articles elsewhere on the web. But in the interest of prudence, you should assume that any link which brings you to a store page or any page offering a product or service is an affiliate or associate link. Associate links are why you will find the following accurate disclosure at the bottom of every page (including this one, if you scroll down and check): Daniel Podgorski is a participant in the Amazon Services LLC Associates Program, an affiliate advertising program designed to provide a means for sites to earn advertising fees by advertising and linking to amazon.com. I have not been given any free products, free services, or anything else in exchange for placing the links; the only compensation would be commissions resulting from referred purchases. And even then, I have only placed affiliate links on the site from businesses that I have found to be trustworthy and reputable. If you have any further questions or concerns about this topic, please feel free to reach out to me; information on contacting me is available in the link labeled ‘Contact The Gemsbok’ near the bottom of this page.